Located along the white sands of Kuta Beach, Hotel Santika Premiere Beach Resort Bali features air-conditioned rooms, 3 beautiful swimming pools and a spa. Free parking is provided. 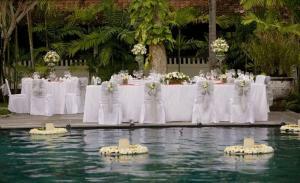 Santika Premier's rooms offer views of the garden or swimming pool. They are equipped with a satellite TV, minibar and tea/coffee maker. 24-hour room service is available. Hotel Santika Premier Beach Resort's spa provides massage and body treatments. A tennis court, children's playground and games room are provided. Day trips can be arranged at the tour desk. A buffet breakfast is served at Wayang Restaurant. Sands Restaurant and Kunyit Bali Restaurant offers international and local dishes. The Lobby Lounge features live music. Hotel Santika Premiere Beach Resort is a 10-minute walk from Discovery Mall, Waterbom Park and a variety of eateries. It is a 20-minute drive from Ngurah Rai International Airport. Car and motorbike rentals are available.